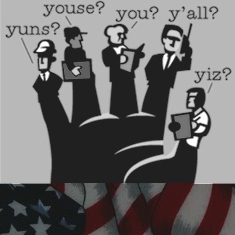 Americans have many different ways of speaking. The way in which you produce your consonant and vowels, which is specific to the area in which you live, is called a regional accent. Regional accents around the United States are alive and well and can have many variations. There are many different types of regional accents but the most popular are the Noo Yawk (New York), Boston/New England, Southern and Mid-Western. Politicians from across the United States have brought their regional accents into public view. We associate the late Senator Ted Kennedy with the Boston accent, Senator Chuck Schumer with the New York accent, and former President Jimmy Carter with the Southern Coastal accent. Hollywood actors, either naturally or with the help of a dialect coach, have created roles that rely on the accurate portrayal of regional accents. In the movie Fargo, we have a good sample of the Minnesota accent. In My Cousin Vinnie, Joe Pesci and Marissa Tomei use authentic New York accents. Fried Green Tomatoes brings us a flavor of the Southern accent and finally, in Good Will Hunting we can hear the Boston accent. In all of these cases, the dialect patterns serve a productive role in creating diversity and local color so that we get a flavor of a particular geographical region. However, there are times when a regional accent interferes with communication. In certain situations, regional accents may cause prejudices and stereotypes. The pronunciation of phonemes (sounds) in a regional way may cause misunderstandings and listener confusion. For example, based on articulation, the word “buses” may sound like “bosses”. When you pronounce the following list of words, do they sound the same or different? If they sound the same, you probably have a regional accent. Why Choose To Reduce Or Eliminate an Accent? For personal and professional reasons, people often choose to reduce or eliminate their regional accent. In the corporate world, your regional dialect may cause you to feel self-conscious and may inhibit you from expressing yourself in an important situation. If you are an actor or a voice-over artist, your regional accent may interfere with the genuine portrayal of the persona you are attempting to bring to life. Working with a Speech Pathologist/Dialect Coach to reduce a regional accent allows you to have a choice when you speak. You can learn how to speak Standard American English for a presentation or audition, and continue to use your regional speech pattern when you are conversing with family and friends. Let us help you modify your local accent now! Call Susan now at (917) 733-3534.